Bachelor’s of Science in Psychology from Pacific Lutheran University. Before I started my MPH, I was a teacher’s assistant for Middle Schoolers with special needs. Why did you choose public health? I think that living in the United States with all the privileges that it has, it is easy to ignore all of the poverty and hardship that people experience on a daily basis. I chose public health because it is an avenue through which I can work to identify the problems in our society that cause people to experience suffering. Public health is also equips me with the tools that I would need to combat those issues and improve the quality of life for people that would otherwise be overlooked. Why did you choose MEZCOPH? I chose to come to MEZCOPH because of the College’s dedication to applying the tools that we learn in Public Health to improving the lives of those in need. I also really like that the college was dedicated to research both locally and internationally. I am interested in breast cancer epidemiology research in developing nations, and the interaction between infectious diseases and cancer. My internship is through the Cancer Epidemiology Education in Special Populations Fellowship Program. 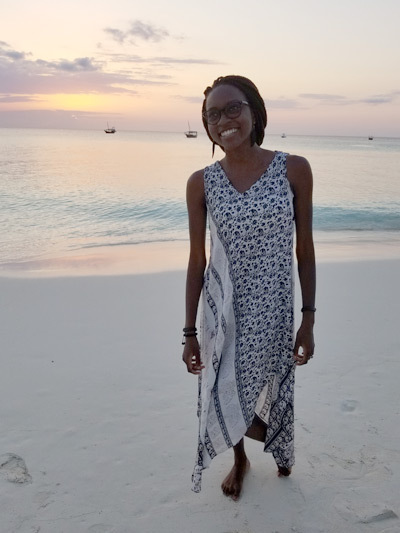 The goal of my internship was to determine if the introduction of hormone receptor status testing changed the way breast cancer is treated in Tanzania. Outside of school, I love to read, play violin, and knit. My advice to future students is this – build relationships with the students, faculty and staff at MEZCOPH. The faculty and staff at MEZCOPH are incredibly resourceful and willing to help students achieve their goals, and if they can’t help you directly, they know someone who can and they will put you in contact with that person.